Christian, it is time to wake up! It is time to embrace the truth and break the spell of false teachings and myths about the end of this age. Christ’s words are coming to pass rapidly and few are ready to serve in His power and protection. The Left Behind series and other fables depicting the rapture before the Great Tribulation have deceived millions of Christians. Jesus foretold the rapture would come at the end of the Great Tribulation period, “But in those days, after that tribulation ... And then they will see the Son of man coming in clouds with great power and glory. And then he will send out the angels, and gather his elect from the four winds, from the ends of the earth to the ends of heaven” (Mark 13:24-27). 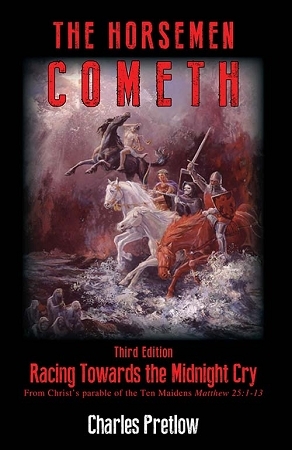 The Horsemen Cometh – 3rd edition Racing Towards the Midnight Cry is an astonishing work that confronts the spell over God’s people with Biblical truth—and addresses how to become ready—God’s way! GOD WILL NO LONGER HOLD BACK THE TIDE of perversion. In this edition: The Midnight Cry pronounced by true servants of Christ is about to startle Christians awake. Millions will wake up and find they do not have enough oil and are not prepared to endure the coming dark hour. The added content in this edition will help you wake up now and be ready to meet Christ! Copyright Wilderness Voice Publishing. All Rights Reserved. eCommerce Software by 3dcart.